They were the glory days; a time when the ABIM was still respected; a time before the World Wide Web and moving diplomate testing fees from the ABIM to a secretly-created shadow "Foundation" could occur below the radar. John A. Benson Jr., MD and Harry R Kimball, MD were the first two Presidents of the ABIM appointed after the bylaws were changed to pay officers salaries. Dr. Benson was the first President of the ABIM from 1975 through 1991 and ran the organization from his home in Portland, OR, leaving his academic and clinical practice for the administrative world of the ABIM save for one long-time physician-patient he kept while serving in that capacity. * Dr. Kimball, his all-too-willing successor from 1991 through 2003, understood the number of doctors being trained was finite and paying executives would be difficult without a new business model. It was Dr. Kimball who conceived of "maintaining" one's board certification through ABIM's Continuing Professional Development (CPD) program to keep the money flowing. But the initially voluntary program flopped as doctors saw the program for what it was: an unnecessary distraction from their busy practices. So CPD would have to become mandatory. His like-minded colleagues at the American College of Physicians (who would also financially benefit) could see to that, and soon money flowed like honey. So much, in fact, that something had to be done with all that money earned by a so-called "non-profit." It was under Dr. Kimball's direction as ABIM's Chairman of the board from 1989-1990, the ABIM Foundation was secretly created in 1989. Multiple money transfers from the ABIM to the Foundation were made to facilitate lucrative investments with (the now-defunct) 1838 Investment Advisors. For a while, it was a win-win for both corporations. So many trades were made that ABIM paid nearly a quarter of a million dollars annually for their services. With that money flowing to the ABIM, nearly $90,000 of artwork was purchased for their Walnut Street offices in Philadelphia in 1997 and 1998. We know this because the ABIM offices were later renovated in fiscal year 2003 as the computerized testing age came to Philadelphia. 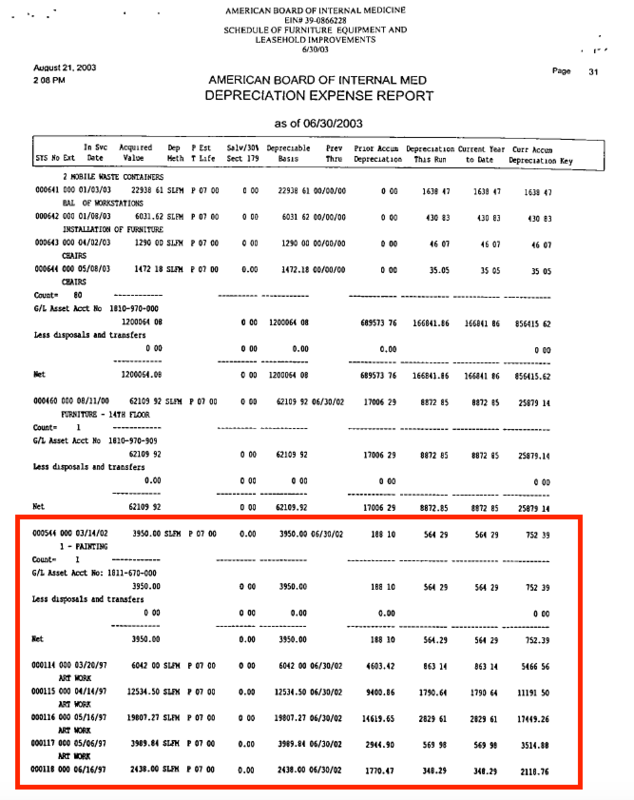 At that time, the value of that art work was disclosed on ABIM's IRS tax forms (see here, here, and here). In total, it appears $89,874 dollars worth of some kind of art adorns ABIM office walls, thanks to ABIM diplomates. No wonder they "surprised" Dr. Kimball with a black tie event and had the first "Kimball Lecture" in honor of him in August, 2004! "The silence has been deafening," said one money management executive in the region, who declined to be named. It's as if they "fell off the face of the earth," said a pension consultant, who asked to remain unidentified. One private equity veteran, who declined to be named, said it's unusual for a firm with such a long history to simply disappear. The firm traced its lineage back to Drexel and Co., a banking and investment management firm founded by Francis Drexel in Philadelphia in 1838. Principles from 1838 Investment Advisors were holdovers from the Drexel Burham Lambert that came under investigation for illegal activities in the junk bond market for stock manipulation. Since that gravy train collapsed, another hopeful investment was made in real estate: a condominum puchase in December 2007. The ABIM Foundation was never about "medical professionalism" or "Choosing Wisely®." It was a "get-rich-quick" scheme using diplomates' testing fees for the organization's own corporate benefit. That is, until it wasn't. * Interview with Dr John A Benson, Jr, MD, conducted April 27, 1999, page 18. The latest scandal to break. Vanity portraits paid for at taxpayer and client expense! Maybe some of this could be cleared up by their highly paid communications VP who we never seem to hear anything from, Pamela Brown White. How much does the taxpayer put out toward maintaining the lives of the rich and infamous? This raises more questions about this "profligate" and "nefarious" organization and how they manage their befuddling financial losses each year. Ostrich head in the vanity wall? doing a walkabout through the executive suite offices. He could take some selfies of the various portraits, newspeak art, and vanity walls. If he doesn't mind getting out of his PJ's and driving downtown? What's wrong with this picture (below) of the million dollar man from Mt. Airy standing with a "teeth grin" in the ABIM lobby with the portrait of their ideals suspended behind him on the wall? The values have depreciated significantly. ABIM's once proud ideals are now as brittle as the glass they're sandblasted on in the Walnut Street lobby. The left side appears opaque with someone's crushing blow. Was it the ghost of Walden's Ponds own Henri David Thoreau that threw the immortalized first brick at the burgeoning American establishment and its smug status quo. Whether a ghost, man or meteor from above, the ABIM is a damaged organization. Theirs is today a shattered legacy of vandals with keys to the executive rooms, breaking into Market Street, ransacking everything of value. Insider thugs took over the office building and the testing company. From then on, the executives and officers of the ABIM would be deaf to to the outside world. Thoughts, feelings and actions would no longer respond and correspond to what is called for and needed. The left and right side, as the proverb goes, do not match up. Hiding their stolen booty from the clients and the IRS, they put it in secret investment accounts and watched the money grow, putting it to work with a reckless investment firm that bet it all, by taking huge risks. Drawing on money from the ABIM "First Bank of Iowa" (Foundation) they increased their personal compensation and created a war chest. After seven or eight years they moved to Walnut Street where they set up new digital shop waiting for ACP Master "Dean Cassel" to arrive. Like all the presidents and chairman before they were chosen because they were already there and they were groomed to fit the politics of corporate America. In the tradition of Thomas Brem kissing up to Big Tobacco and their government proxies. This corrupt structure has not changed one bit today, and it has even gotten worse. So, to be on que with industry need and political ambition, the highly paid new "Dean" Christine Cassel arrived at the ABIM without skipping a beat, just in time for the presidential elections and heated health care debates of 2004. Then suddenly, their risky investments crashed and burned. It was an embarrasing setback as it would expose their desires for financial power. They were forced to liquidate their equity positions. They sold nearly the whole portfolio to cover-up the huge losses and personal bleeding. The Foundation would have had a great deal more money today if they had only invested the money in low-expense conservative index funds and kept the money there. Then came 2007 and 2008 the next round of health debates and a new presidential race. This time Dean Cassel's team won and she went to DC leaving her appointed people in charge to wage war against physicians and patients. Just as she did in Oregon, putting proxies in place, while she waited for Harry Kimball to quickly retire, and move on to become senior advisor to one of the top ranked schools in the country with some of the highest levels of NIH funding. Remove the veil and facade, what do you see? You see barons, deceitful CEOs, malicious COOs inquisitional panels, unscrupulous lawyers undermining the constitutional rights and privacy of individuals using felonious thugs. You see all of them in the mind's eye swiveling like kingpins in their plush custom-made leather chairs. Why? To pay for the rich. Golden parachutes are the new normal according to the ABMS - annual income for the CEO today is equal to one golden parachute for Harry Kimball's generation. When will they stop the habitual advancement of their personal finances each year, while the science of medical specialty testing lags light years behind in its funding and quality? 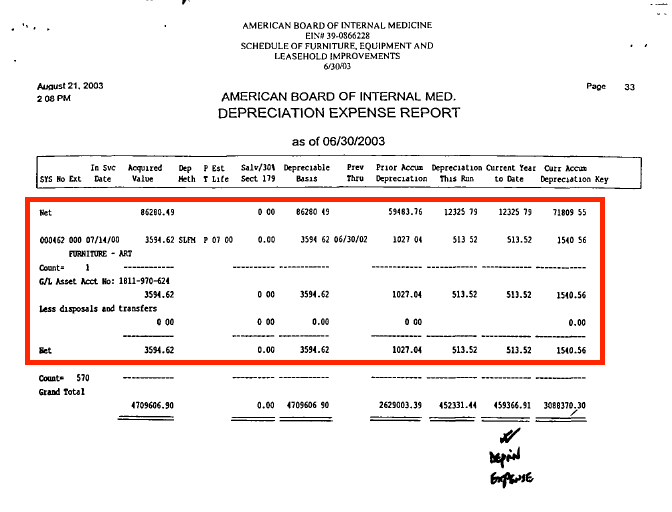 Rich Baron of ABIM makes 850K+ per year. Divide that by 365 days; it equals $2330 per-day or $300 per-hour. That's 1165 times the daily wages of one third of the world's population. Baron makes roughly 12 to 16 times the average household incomes of the highest paid countries on the planet. Switzerland and Luxembourg. Compensation for the ABIM CEO compared to America is 20 times the average income. If we compared his wages with the lowest paid employee of the ABIM, Baron's compensation would dwarf it to the point of anyone concluding that Dr. Baron is running a sweat shop in order to pay his exorbitant and totally unjustified elitist compensation. If anyone thinks this concerned person never had to work as a maid in Las Vegas or Los Angeles, or Lake Tahoe, think again! I'd like to see some real equity in the world; why not let it start with the ABIM. "When photographs are so much cheaper than paintings, politicians [and ABMS executives and officers] need to think twice about spending our money immortalising themselves or their friends on canvas, or even in bronze." This passage from the Guardian above captures my sentiments perfectly as a taxpayer. 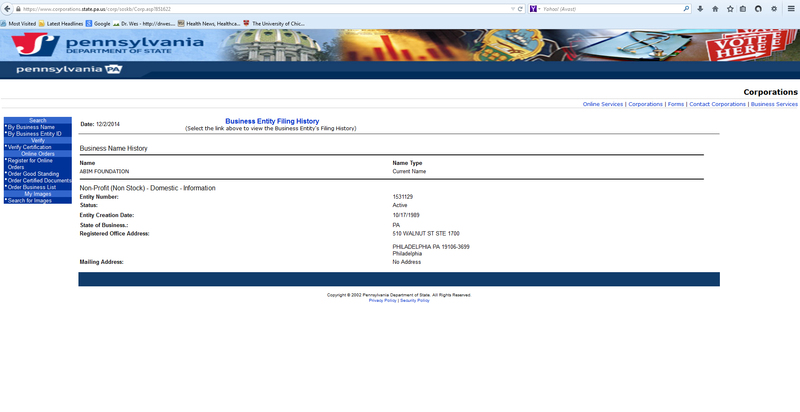 Has all this information with Mr. Kroll who said has sent this information to the Iowa attorney general been dealt with? 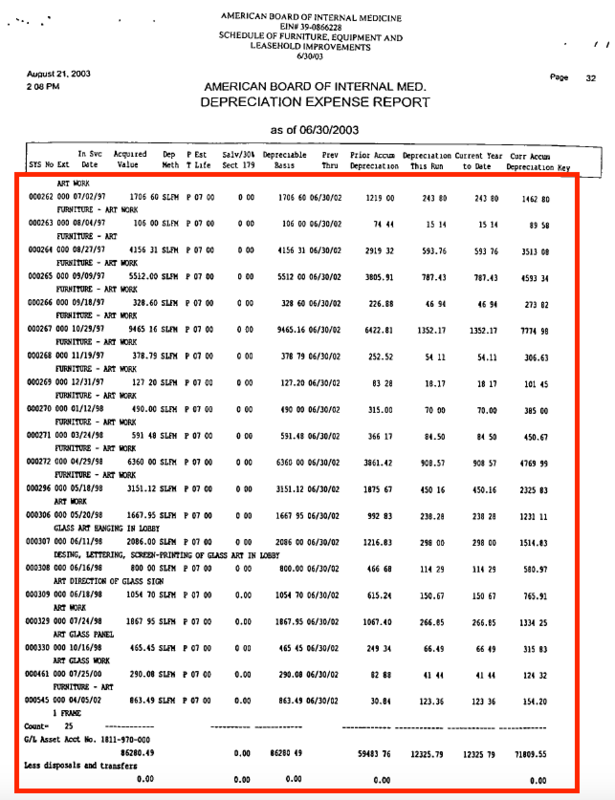 Has the discrepancies in the tax statements been sent to the IRS? It seems the leaders of the medical specialties such as ASCO, ACP will continue to condone MOC or any rebranding of such a scam. When volkswagen was caught with tampering with the software to monitor their emissions, there were mathematical models to show that there was real harm to the environment and to the individuals, why does not the ABIM and ABMS look into this like any other clinical trial to bring a drug to market or a procedure to patients? MOC is the golden goose. MOC money represents political ambition and largess of the ABIM. The ABIM Foundation contains money that does not belong to the supported organization. Physicians were squeezed dry to cover the fiduciary irresponsibility, non-stop corporate lobbying, and the aggregate losses from betting the farm on Wall St. It is high time for the ABIM to return the profits back to the physicians who overpaid and the taxpayer who was lied to about the hidden politics and corporate coziness. To claim that much money for professional expense on one's tax returns may be fraudulent. Physicians and employers are perhaps complicit by covering up and going along with the testing fee overpayment, thereby docs and reimbursing institutions may be participating in tax fraud by not reporting their expenses accurately. So it may be tax fraud, as well as largess, dumped on the backs of hard working physicians who are forced to pay, but have little tine and even less free cash flow to deal with properly. The IRS may not make a distinction between peep and victim when they tend to view view all parties as being complicit in money scams. Doctors are not not without means to correct this 'tax scandal' and extortion. It is true that MOC and outrageous certification fees that may be one the biggest Ponzi schemes and price-rigging scams in the history medical education and standardized testing markets to date. Extenuating circumstances and mitigating factors aside, physicians and their reimbursing institutions are possibly participating in fraud, whether it's extortion or not. If the fraud is real a complaint on a blog is insufficient. Writing on blogs or in Newsweek is all hearsay anyway. Do something by presenting the ABMS fraud to the courts, with the DOJ and IRS. Be a whistleblower. Fight it in court. Seek a temporary injunction at least on MOC to suspend the mandates until the justice department can open a case and review the facts. They may seek a large fine from the ABIM/ABMS and put the case in their pipeline of probable settlement claims. One should not take aiding and abetting ABMS/ABIM lightly. Every business uses the courts to correct issues of corporate theft. This corporate theft of an extraordinary kind. Physicians should follow the ABIM's own lead. A real lawsuit with some competent power attorneys will deep-six the abim/abms and set the record straight who the real cheaters are. The ABIM attorneys are a disgrace, especially the ones who have made their livelihoods and created markets for themselves out of advising and exploiting the ABIM/ABMS and misusing physician fees. They have done much to dishonor the profession. Ballard Spahr has abused their political power within criminal justice system. The AMA claims in their 2016 end of year financial statement and "message to stakeholders" that they are working hard for physicians and patients. It appears that the AMA works not for the physician or patient, but for the ABMS. The AMA (HOD), with overwhelming support from physicians and their representation, resolved to end mandatory MOC in June, 2016. Here we are one year and four months later and they have ignored their own resolution. Why? I believe the answer to their stonewalling, lies in the 2016 annual report titled "Born To Do This". In June 2016, at the AMA House of Delegates meeting in Chicago, one of the topics discussed was Maintenance of Certification. However, what was not mentioned in the AMA press (or really, any other press) was the fact that the AMA officially opposes mandatory ABMS recertification exams. Asking the American Board of Medical Specialties to encourage its member boards to review their MOC policies regarding the requirements for maintaining underlying primary or initial specialty board certification in addition to subspecialty board certification to allow physicians the option to focus on MOC activities most relevant to their practice. RESOLVED, That our American Medical Association call for the immediate end of any mandatory, secured recertifying examination by the American Board of Medical Specialties (ABMS) or other certifying organizations as part of the recertification process for all those specialties that still require a secure, high-stakes recertification examination. Consumers, patients, hospitals and other users of the Board Certification credential expect board certified physicians to be up-to-date with the knowledge, judgment and skills of their specialty—both at the point of initial certification and along the physician’s career path – and to verify it through an external assessment. The privilege to self-regulate which physicians enjoy demands that we meet that expectation with more than just continuing medical education. Continuing medical education is an important component of a physician’s continuous learning and an important part of Maintenance of Certification (MOC), but by itself is not sufficient to verify that a physician is up to date. The other components of MOC—professionalism, external assessment of knowledge, judgment and skills, and improvement in medical practice—are also important. The AMA also approved a resolution to continue working with ABMS to “encourage the development by and sharing between specialty boards” of alternate ways to assess medical knowledge, other than by a secure exam. The AMA HOD also bolstered its support of using appropriate continuing medical education (CME) courses to maintain quality assessments of physicians." "Posted by Thomas Sullivan - Policy & Medicine Writing Staff at 05:07:00 AM in AMA, CME, Maintenance of Certification"
I wonder if Dr. Baron has commissioned a portrait of himself yet? How about painting this into the picture. Someone above was being very generous in describing his income from the ABIM and ABIM Foundation and all those bonuses for losing money each year. You know, Rich Baron's actual income should have been divided by 220 ABIM work day, and not 365, to accurately compare his outrageous payday with the rest of America. That puts his income closer to 30X a family's household income in America. Not 20X. And 2000X the household income of the lower third of the global population. The story of the the ABIM is one of the most shocking tales I have ever encountered in my life with all the intrigue that has been going on right beneath our noses. The story reminds me, with all the various scandals and keeping the "pretty/handsome face" throughout, of the Oscar Wild novel, "Picture of Dorian Gray". The movie versions, in all the various adaptations, present as one of the scariest screenplays of all time. If physicians consider ABIM and the other member boards to be their leadership representing them, then doctors are blind about what and who these organization really represent and what kind of mon(k)ey business they are conducting at physician expense. If physicians and the public believe that the ABIM (or any medical board) is involved in self-regulation and inculcating sound educational practice into the profession of medicine, then they are deeply mistaken. From previous comments on strategies was to send the information to the attorney general's of Iowa as per Mr. Kroll. Other strategies would be complaints sent to multiple state boards on how some individuals were mistreated by the ABIM as there are a false bureaucracy or that the MOC creates unworkable atmosphere at some jobs or that the MOC is discrimanatory. Could complaints be sent to the FDA concerning MOC as with a new drug or procedure, efficacy has to be proven? Why is not MOC being treated at the same? Could assistance from legal areas such as the ACLU or the NAACP as MOC could be limiting health care as it targets certain physicians with unproven results for regulation and that certain ethnic groups either physicians or patients are being hurt by MOC? Could the FTC be used to stop monopolistic business practices as CME should cover this and why is MOC the only way that a physician can work through some insurance companies or hospitals? Has the IRS been sent the copies of their statements with the shown discrepancies? MOC testing will now include Wolters Kluwer as a Pearson/ABIM business partner. Test runs of the 2 year MOC by selected "pilots" were inconclusive. No test drive was offered for the 10 year test w/ UpToDate, yet they are offering it open book also as the format resembles real life practice. What are they doing? How many docs will fail using UpToDate in ABIM's latest folly they pretend to call science? No one has statistics to convince me that more harm will result. End MOC. It is the only convincing time proven solution. Patients and docs will be harmed as corporate considerations, hidden lobbying and copyright bs taint certification boards even more with politics and undisclosed financial arrangements. Wolters (UpToDate) is a Dutch co. with globalist financing and a lobbying powerhouse. Look at all they have their claws into already. The ACGME has also merged with the globalist banking/private equity cabal manipulating/ experimenting, influencing US healthcare behind the scenes. And the US claims it is worried about foreign influence? Distraction and headfake obscure what is really going on. When you look at the medical boards and ACGME today it is no longer an American experiment in professional self-regulation . It is a global business enterprise; a puppet of the industry and a hidden financial consortium with a slogan of "cost cutting and value" leading the charge. Special interests as always are pulling the strings of politics and corporate finance. The self in self-regulation ceased to exist decades ago. When will the sleepers awake, seeing and gathering enough force to turn the tables? Medical science has merged with "the industry" and "merger law". Who decides on the questions? Who decides on the answers? How many questions will be left unanswered on the test for taking too much time with UpToDate? Who decides the lab values/ranges? Can we have full disclosure on everyone involved? What the ABIM and other boards propose is ludicrous! The propose unlimited conflicts of interest as a side dish to corporate corruption. Read the attached self-portrayal of the "2013 Harry Kimball tuxedo event", with keynote speaker Ezekiel Emanuel - featuring a host of revolvers in the health care/quality assurance industries. This ABIM retreat/event/dinner illustrates how the endless partisan payouts to executives and officers at the ABIM and ABIM Foundation has gone toward "advancing crony professionalism" and supporting corporate special interests "in the new millennium". Physician fees were (and are still being) used to support the creation and maintenance of their own partisan political and social vision of America treating Foundation money and co-opted client fees as their own piggy bank and checking account. ABIM created their "war chest" (Foundation) to help support the implementation of a 'global payment structure' for US healthcare, and to prop up a strict narrow and dogmatic cost restricting/value plan, including the inappropriate allocation of millions of dollars in funds to foster and support the Choosing Wisely campaign by the ABIM Foundation. And to support a host of individuals who have no business getting rich working for a charitable organization. To be clear, what has been exposed is the ABIM, ABMS, AMA, ACP, ACGME, NQF, NCQA executives, officers, staff, and countless others in the 10-trillion dollar non-profit corporate spaces colluded full-time on their hidden healthcare reform plans behind the public's back. This is wrong and it violates everything about a non-partisan, apolitical, non-pecuniary "charity". The self-enrichment and self dealing thrust on the public without so much as a blush must cease. The MOC gravy train must be pulled from tracks and cease serving the ABMS' unwholesome self-inurement money line. My first serious question about all this is what is our "leadership" doing to correct this travesty involving obvious abuse of power and funds? The answer unfortunately comes in the form of "transformative newspeak and endless distractions" concerning their violatory actions and evasive stances. This is particularly evident in regard to the entrire franchise using non-profit corporations for their their political and social agendas. Plus the continued "stonewalling" of the AMA HOD's resolution to end mandatory MOC immediately. Then, my next question, after ABIM's neck bending posturing in the sand, and pulling the blankets over their heads like naughty children, is why aren't the Federal and State governments/authorities investigating these self-appointed quality assurance leaders and indicting them for crimes against physicians' right to work, patients' right to care, and the taxpayers' right to not be burdened with ABIM/ABMS' unpaid share. I am referring to ABIM's unethical manipulation, obfuscation, omission and misstatement involving their obligation to follow US tax codes and not violate federal, state and local statutes concerning corporations with tax-exempt status. We are all being violated financially and personally (privacy, civil liberties, ethics atrocities, trade restraints) by the ABIM and their quality/testing/surveillance cartel to the nth degree. It really is time for the shenanigans to end. It is not just an embarrassment what they have been doing, it is imo criminal that they don't all resign. The US healthcare system will breathe the greatest sigh of relief when they get out and try to find honest useful jobs, if anyone such a labor pool will look past their egregious behavior/conflicts of interest and hire them. Transformation to "Patient Centered Care"
doubling down on their onerous MOC scam! Dr. Baron has never addressed the NQF/Kaiser/Premier, Inc. scandal involving Christine Cassel's egregious conflicts of interest that were revealed by ProPublica and others in 2014. Why didn't Rich speak out about the outrageous behavior of the former ABIM and ABIM Foundation CEO/President? This silence on matters of corruption involving the ABIM and its executives still strikes everyone, except the perpetrators, as very odd. Especially so, because the conflicted years for Dr. Cassel also included her entire 10 years at the ABIM. What about the NQF kickback scandal with their safety chairman Charles Denham? What about Health Care Concepts (Denham's company) and CareFusion and the unprecedented active joint marketing of a medical product (chloarprep) via NQF's potent recommendations lists. It is amazing to witness how the new ABIM CEO (Rich Baron) has failed to respond to scandals adequately. Is it because Rich said he would build on the successes of Christine Cassel, and if you call losing money while at the same time stuffing a truckload in your pockets over $10 million with all the free rent and other improper perks, sealed his fate to the same egregious conflicts and corruption with his silence on these matters. The CareFusion kickback scandal involving the NQF places both Cassel as CEO and Richard Baron at the heart of the corruption scandal. Cassel helped found the organization under the Clinton administration and Richard Baron was a seasoned board director during the alleged illegal kickbacks were taking place by the safety committee chairman Chuck Denham. Dr. Baron was a member of the NCQA Standards Committee from 2005-2011 and a director of NQF from 2009-2011. The years Baron served the NQF stakeholders puts him right in the heart of the CareFusion kickback scandal, which was alleged by the DOJ to be from July of 2008 through August of 2011. The DOJ lawsuit settled for over $40 million shows that Dr. Baron and others were clearly in the timeframe to be involved or turning a blind eye for the sake of corporate and personal interests. Dr. Baron has millions of reasons to remain mum. He is on pace to break Christine's compensation record for the most egregiously paid salaries in the history of the ABIM and its infamous sidekick organization called "the foundation" - popularly known as the "big piggy bank" or just campaign central and executive compensation "slush fund". Give Charles Denham (and Bob Wachter's) rise to prominence "from out of nowhere" and his election to chairman of the Journal of Patient Safety, plus Wolters Kluwer's infiltration into ABIM, ABMS testing and surveillance, should the Dutch company be forced to register as a foreign agent? They have powerful money backing them from foreign sources.